The main Joshua Tree National Park visitor center is situated in the town of Twentynine Palms, a few miles north of the park, next to Oasis of Mara; from here a 50 mile through road crosses the park to another visitor center, at the Cottonwood Spring oasis, close to the south entrance near I-10. At first, this route ascends quite steeply to nearly 4,000 feet, through the Pinto Mountains; near the highest point are two of the many good campgrounds in the park (Belle and White Tank). Each individual site has a bench and a fire-ring, and is nestled amongst large boulders, shielded from neighboring sites and surrounded by many Joshua trees and cacti. 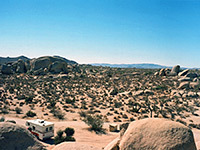 NPS campgrounds don't come much better than this - the location is peaceful and atmospheric, especially at night when guests can sit in the open to experience the stars, the ever-present outlines of the Joshua trees, the enclosing stark boulders and occasional noises from unseen animals. Because of the relatively high elevation, for most of the year the temperature is pleasantly cool at night, in contrast to the hotter conditions in the deserts below. 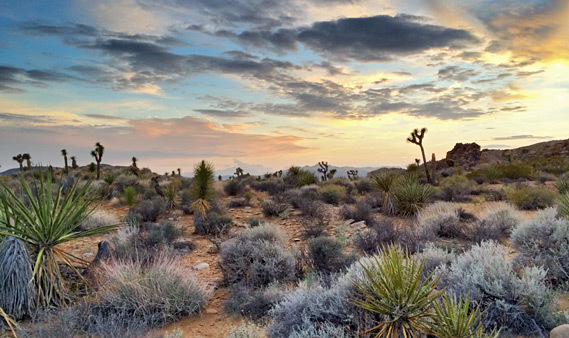 The western section of the park is between 4,000 and 5,000 feet in elevation, and is part of the Mojave Desert, where sufficient rain falls to support a variety of other plant life as well as Joshua trees, a species that needs more water than many other desert plants. The trees are widespread for several miles beyond the campgrounds, especially in Queen Valley and Lost Horse Valley, but they soon peter out eastwards, to be replaced by various types of cacti as the road descends into the huge flat expanses of Pinto Basin. 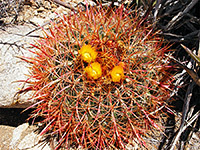 Particularly common are the cholla (Opuntia Bigelovii, or 'Teddy Bear Cactus'), around 2,000 feet elevation - cholla are common across the hotter parts of the Southwest and are notable for their ferocious spines, which are sharp, grow very densely and are easily detached, since they are covered with tiny reverse barbs that cause them to pierce and penetrate the skin of any approaching animal at the slightest touch, hence their other common name of 'Jumping Cholla'. At the Cholla Cactus Garden, a short nature trail with a series of informative plaques winds through a particularly dense region; beyond here, the road continues to descend towards Cottonwood Spring. 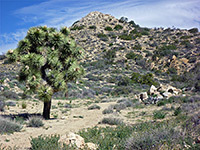 More points of interest, and the densest forests of Joshua trees, are found along Park Boulevard Road that links the main entrance road with the west entrance near Yucca Valley. A spur leads to Keys View, an overlook from which on a clear day Palm Springs, the Coachella Valley and the Salton Sea can be seen, 5,000 feet below. The line of the San Andreas Fault is also detectable. An easy half mile path ascends the hillside at the north to the highest peak in the park - a rocky summit at 5,558 feet with even better views of the surrounding mountains (see panorama). 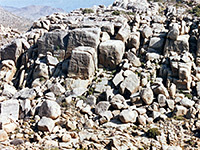 There are several especially large groups of the distinctive monzonite granite boulders close to the Park Boulevard Road, such as Hidden Valley and Jumbo Rocks, both of which have good campgrounds nearby. The rocks are fun to climb and offer many short but challenging routes requiring equipment and some degree of skill though most are less taxing and it is easy to ascend a little and get a high view of the amazing landscape. Most serious climbing takes place during the winter season, as summer temperatures often exceed 100°F. The best place of all is the Wonderland of Rocks, part of the north central mountains, which contains many square miles of huge boulder piles, crisp sandy canyons and pristine desert plants (see panorama). A trail enters the south end of the rocks, beginning from a side track that leaves the Park Boulevard near the Happy Valley campground. It does not extend very far, but this is a great place to wander freely for a while, along the dry washes and amongst the rocks. Another entrance to the rocks, also near a campground (Indian Cove), is via Rattlesnake Canyon. 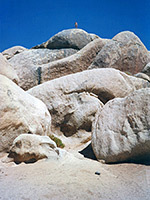 One further region, accessed by a separate road, is Black Rock Canyon in the northwest, a relatively high elevation area with plenty of Joshua trees; trails here include High View, Panorama and South Park Peak. Quite a few old mine shafts and tunnels are scattered over the mountainous regions of the park, usually in remote locations. 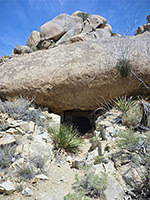 The most often visited, and best preserved, is the Desert Queen Mine, situated a few miles north of the Jumbo Rocks campground and reached by an unpaved though well maintained side road. A short path climbs to the edge of a steep-sided dry wash, a site where gold was discovered in 1895 and mined productively for the next 70 years. Relics include several ruined buildings, over a dozen mine shafts, large tailings piles and various pieces of rusting iron equipment. The tunnels in the main area have been sealed for safety though some on the opposite side of the canyon to the north have been left open. This is an interesting region, easily reached and quite scenic. Another similar location is Lost Horse Mine, along the road to Keys View.